The Ryobi 1600 psi Pressure Washer is compact and lightweight, making it easy to move to various locations around the house and job site. With a powerful 13 Amp electric motor, this unit delivers 1600 PSI of force for quick cleaning of driveways, decks, windows and patio furniture. Featuring a durable and compact roll-cage frame design, it is designed for easy transport. The on-board detergent tank offers hassle-free cleaning by eliminating the need to drag a bucket and hose behind you. The Ryobi 1600 psi Pressure Washer is equipped with on-board accessory storage for added convenience and a bonus Turbo Nozzle for up to 50% more cleaning power. It is backed with the Ryobi 3-year limited warranty and is guaranteed to deliver results for years to come. Performance, value, convenience. The new Karcher K1710 electric pressure washer delivers best-in-class, consumer-driven features to improve the way we clean. Integrated metal extrusions, oversized wheels and overall robust design allows you to take the product where you need to go. Key ease-of-use features include high cord wind, tall handle, bucket storage bin, removable detergent tank and an innovative on/off foot switch. Universal quick-connect wands and standard M22 hose connections simplify nozzle and accessory usage. Performance, value, convenience. The new Karcher K2010 electric pressure washer delivers best-in-class, consumer-driven features to improve the way we clean. Integrated metal extrusions, over-sized wheels and overall robust design allows you to take the product where you need to go. Key ease-of-use features include high cord wind, tall handle, bucket storage bin, space-saving rotating handle, dual removable detergent tanks, pressurized hose reel and an innovative on/off foot switch. Universal quick-connect wands and standard M22 hose connections simplify nozzle and accessory usage. The Pulsar 2000-PSI Electric Pressure Washer generates an incredible 3200 cleaning units and features GFCI overload protection, a 25 ft. hose reel and 35 ft. cord storage and a patented 4-position select wand (includes concentrated and dispersed spray patterns). Add to this a low-pressure chemical stream and a high pressure, turbo position for enhanced cleaning capability, along with a wand holster and mobility kit for compact storage, and its no wonder that the PWE2000 is the unit that so many look up to when considering quality electric pressure washers. Meet SPX200E, the ultra-lightweight, compact pressure washer from SUN JOE.Packed with 10 amps of pure cleaning power, this mini dirt-blasting dynamo delivers a mighty blast - up to 1350 pounds of pressure per square inch to demolish every last bit of dirt.Pump up to 1.45 gallons per minute to get really clean, really fast.Simply twist the adjustable nozzle to go from intense jet to gentle spray and watch SUN JOE make light work of dirt, grease, mildew, oil, mud - and so much more! And, at under 10 lbs, SPX200E is the perfectly portable choice for quick cleaning projects,like the car, boat, RV, porch, deck, siding, windows,and patio furniture Plus, you'll always clean smarter, not harder,with the SPX200E's built in TOTAL STOPSYSTEM designed to switch off the pump when the triggers not engaged to save energy and prolong pump life.Declare war on dirt, gunk and grime - and Go With Joe! 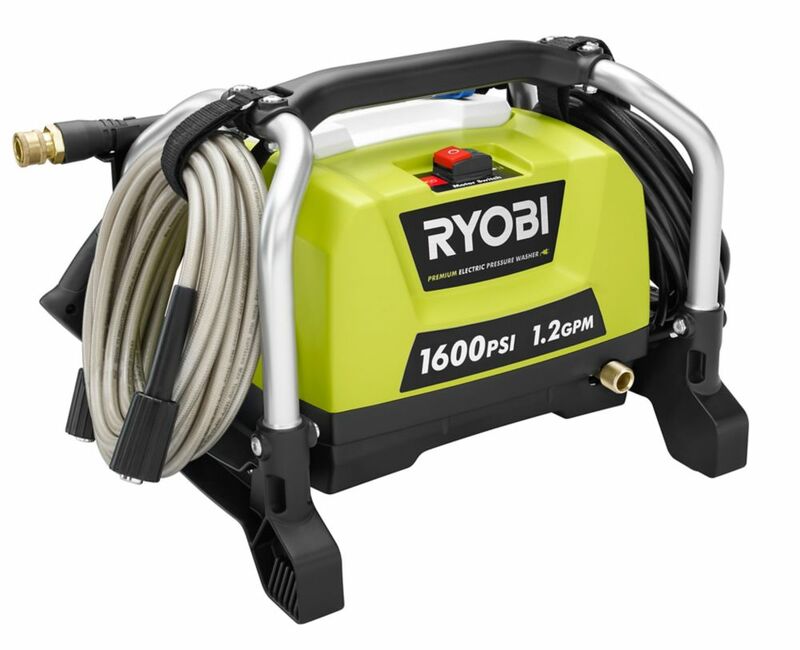 1,600-PSI 1.2-GPM Electric Pressure Washer The Ryobi 1600 psi Pressure Washer is compact and lightweight, making it easy to move to various locations around the house and job site. With a powerful 13 Amp electric motor, this unit delivers 1600 PSI of force for quick cleaning of driveways, decks, windows and patio furniture. Featuring a durable and compact roll-cage frame design, it is designed for easy transport. The on-board detergent tank offers hassle-free cleaning by eliminating the need to drag a bucket and hose behind you. The Ryobi 1600 psi Pressure Washer is equipped with on-board accessory storage for added convenience and a bonus Turbo Nozzle for up to 50% more cleaning power. It is backed with the Ryobi 3-year limited warranty and is guaranteed to deliver results for years to come. 1,600-PSI 1.2-GPM Electric Pressure Washer is rated 4.5 out of 5 by 1342. Rated 5 out of 5 by KDelPozo from Pressure washer works great perfect for around the house projects.... Pressure washer works great perfect for around the house projects. Stronger and durable then I expected. Very happy with purchase! Rated 5 out of 5 by PaulB from Great little pressure washer! I may go get another!... Great little pressure washer! I may go get another!